American Mobile Staging, the staging division of Super Staging and Lighting, has expanded to serve Florida with their 21 years of experience with mobile staging. Contact us now to make your next event a success! Call Dave Girardi, our Florida Stage Expert at (708) 243-7091. 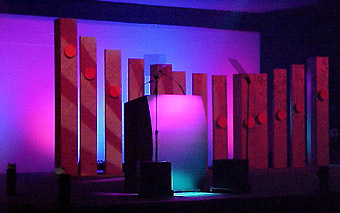 Since the late 1980s, Super Staging and Lighting has been successfully produced amazing events across the Midwest. Now we bring that same cutting edge technology, creativity and excellent service to Florida. Super Staging and Lighting will provide you with an experienced team of designers, technicians and production staff to ensure that every aspect of your event receives the attention to detail it deserves! Super Staging and Lighting is dedicated to providing our clients with the highest degree of professionalism, creativity, and cutting-edge technology for every event. Nick Serino and Dave Girardi have over 40 combined years of experience with setting up professional stages for Corporate and Municipal Event Planners, Bands, Festival Directors and Wedding professionals. Our stages are engineered for safety, reliability and most importantly, to your budget. For 21 years Super Staging and Lighting has provided services for corporate productions, live entertainment and religious events. In today's ever-changing world of technology, Super Staging and lighting has led the way by providing products years before the competition. Contact Nick Serino at 847-584-0350 or Dave Girardi at 708-243-7091 to make your next staged event a success!